FLOZi wrote: There are only 2 forum admins and one of those is an engine dev. In the literal sense, there are currently 8 forum admins. Of those, only 4 have logged in within the last year or so (let alone done anything adminy). Topic: Spads STILL has no multi-engine support??? Re: Spads STILL has no multi-engine support??? Heh, pushback on that was part of the reason I lost focus. Topic: [SOLVED] Command REMOVESCRIPTTAGS missing in uberserver? Re: Command REMOVESCRIPTTAGS missing in uberserver? nice. should be an easy fix. The UnitShapes widget uses OpenGL tricks to do seamlessly-merged circles/shapes. SMAA looks good for everything but pixel shifting/walking in the distance - when they show real-game scenes, only the CSAA/SSAA 16x filters get it right. All of the Unreal demos are run on 1-3 GTX 680s iirc. The original demo with the guy on the roof with a cigarette was originally run on 3x 480s, and now on a single 680. 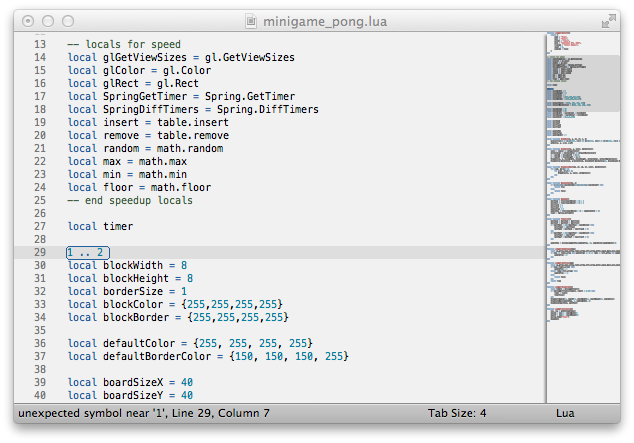 I just added Lua support to sublimelint for those of you using Sublime Text 2. This means inline syntax highlighting, saving you a pesky Spring reload for syntax typos and such.